"The men that I'm with — I feel like they deserve my worship"
"So often, we reserve words like 'adoration' and 'exalting' for a religious context. 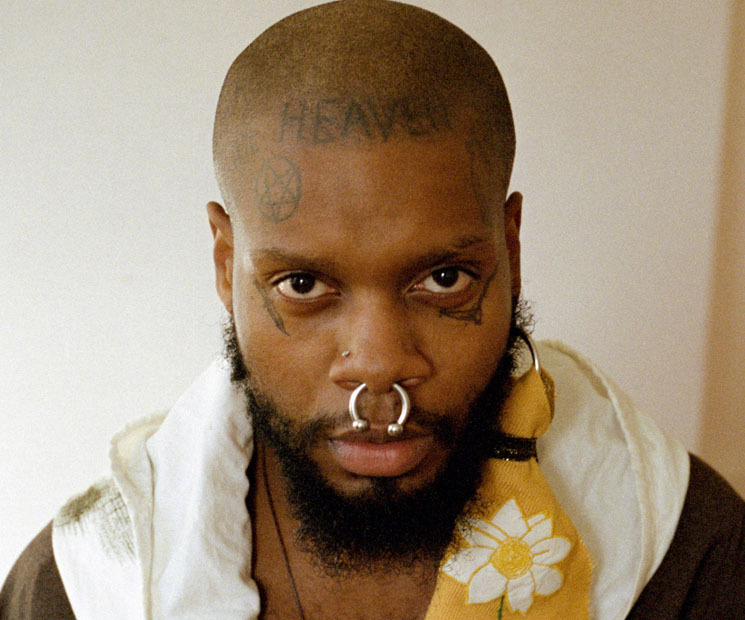 I don't," says singer-songwriter serpentwithfeet, born Josiah Wise. "For me, using the word 'worship' doesn't just belong to some statue in a sanctuary. Those words could be used for a partner or someone that you just hooked up with. I take all of my encounters seriously, especially my romantic ones. It's important for me to give them their full value." His upcoming album soil does just that. It is a thorough and deeply intense exploration of love and romantic relationships: the joyous, tragic and all moments in between. "I'm not really interested in being in a lukewarm relationship with any man. That's a waste of time for me," says the Baltimore native. "[I can't] just say 'I really like him' or even 'I love him to death.' What if we raise the stakes on that? The men that I'm with — I feel like they deserve my worship." Similar to his 2016 EP, Blisters, there is no line between sensual and spiritual on soil. Raised in the church, Wise brings the stirring drama of gospel to his album, but adds carnal flourishes that transcend the sanctuary. "I get to be devoted to him," he proclaims on the gripping hymn "cherubim." "I get to keep my mouth filled with you. Sowing love into you is my job." While he is not the first to wax lyrical about love and romance, his overt and unabashed approach to the subject is rebellious in this era of trendy narcissism. Today, it's common to sprinkle love songs with a healthy dose of hubris, to present oneself as above the trifles of romance. But on soil, Wise steps outside of himself and focuses his narrative on how fully he devotes himself to others, with no hint of shame or pride. "I'm great at illuminating what is wonderful about you. I actually prefer to talk about how amazing you are. My loving style is about being incredibly available," he says. "I have so much love and time inside of me. Like, even through the difficult things. Even if we're arguing, I think 'What a joy to be arguing with you.'" It's this humility that sets soil apart. A resolute and unyielding narrator, there isn't a moment on the album where Wise comes off as vulnerable in a performative sense. Both as a lover and as a songwriter, he showcases his submissiveness as a strength. "I approach my songs the way I work with my dolls and imaginary friends. I like to talk to them. Once you give that character a face, it grows legs and tells you where it will and will not go," he says. "On this album, I tried to listen better. I had to think 'What does this song need? What do you want? Where do you want to go?' And the songs changed so much. My songs are organisms. They need water, light and space." Wise is an expert at surrendering, both to his lovers and to his creative process. He also treats himself with the same great care. In preparation for soil, he became very particular about the images and sounds he consumed, all in an effort to nurture love within himself. "It's been important for me to watch really loving films where I see black people loving on each other. Where I don't see black gay men being exploited," he says. "There's certain things I just don't watch anymore. Certain songs I just can't listen to. I'm impressionable and I know that things are going to stick with me. So I try to limit what I absorb. I think that's really important when you're trying to heal." Sonically, soil is just as passionate and intense as Wise's takes on love. Layered with chunky harmonies, robust colour and a bold, sometimes chilling soundscape, this album is an exercise in taking up space. On Blisters, Wise says he was more focused on being delicate, in order to counter what he'd been socialized to believe about masculinity: that men were supposed big, brawny and imposing. But now, having explored the minutiae, he's inspired to expand his sound. "Me and the engineer talked a lot about getting a warmer, bigger sound," he says. "On this album, the sound is a lot thicker. I've just become bigger as a person. I'm louder and a lot bolder. I have this incredible wingspan." soil comes out June 8 on Secretly Canadian.